Telemachus: President Obama and Congress: Who is 'Thelma' and Who Is 'Louise' As They Drive The US Economy Off The Fiscal Cliff? 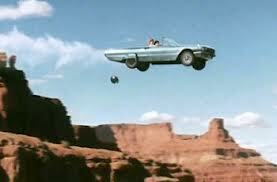 President Obama and Congress: Who is 'Thelma' and Who Is 'Louise' As They Drive The US Economy Off The Fiscal Cliff? The CBO recently came out with an update to their 10-year Budget and Economic Outlook...and it wasn't pretty. Basically they said if the fiscal cliff is not fixed by President Obama and the House and the Senate before the end of this year, 2012, we will fall back into a recession. How's that for grabbing your attention? You want to go backwards and relive the downside of the past 4 years, again? Here's the report in full: CBO Read it for yourself if you have the guts and the stomach for it. 'For fiscal year 2012 (which ends on September 30), the federal budget deficit will total $1.1 trillion, CBO estimates, marking the fourth year in a row with a deficit of more than $1 trillion. Wow, that is really, really bad! Wonder if Presidents Reagan, Bush 41, Clinton or Bush 43 would have gotten the pass President Obama has gotten from the media if they had had 4 straight years of $1 trillon+ annual deficits? That projection is down slightly from the $1.2 trillion deficit that CBO projected in March. Thank God for little favors then! At 7.3 percent of gross domestic product (GDP), this year’s deficit will be three-quarters as large as the deficit in 2009 when measured relative to the size of the economy. What the heck are they trying to say here exactly? Just say it then. Federal debt held by the public will reach 73 percent of GDP by the end of this fiscal year—the highest level since 1950 and about twice the share that it measured at the end of 2007, before the financial crisis and recent recession. Twice as bad. We were told by President Obama that he was going to cut deficits in half, not expand them. CBO expects the economic recovery to continue at a modest pace for the remainder of calendar year 2012, with real (inflation-adjusted) GDP growing at an annual rate of about 2¼ percent in the second half of the year, compared with a rate of about 1¾ percent in the first half. The unemployment rate will stay above 8 percent for the rest of the year, CBO estimates, and the rate of inflation in consumer prices will remain low. Both of those growth and unemployment numbers are bad. CBO has prepared—as it does under its routine procedures—baseline projections (Dream World) that incorporate the assumption that current laws generally remain in place; those projections are designed to serve as a benchmark that policymakers can use when considering possible changes to those laws. However, the outlook for the budget deficit, federal debt, and the economy are especially uncertain now because substantial changes to tax and spending policies are scheduled to take effect in January 2013. Therefore, CBO has also prepared projections under an alternative fiscal scenario, (Real World) which embodies the assumption that many policies that have recently been in effect will be continued. Key aspects of our projections are illustrated in the figures below. Sharp reductions in Medicare’s payment rates for physicians’ services are scheduled to take effect. Will never happen. Ever seen the doctors or hospital lobbies go into full triage mode on Capitol Hill?. The deficit will shrink to an estimated $641 billion in fiscal year 2013 (or 4.0 percent of GDP), almost $500 billion less than the shortfall in 2012 wow! how great would that be from purely a deficit-reduction point-of-view...if it were only true that it was going to happen. and that the automatic spending reductions required by the Budget Control Act, which are set to take effect in January 2013, do not occur they won't; no one is that stupid to allow them to take place (although the law’s original caps on discretionary appropriations are assumed to remain in place). The economy would be stronger in 2013: Real GDP would grow by 1.7 percent between the fourth quarter of 2012 and the fourth quarter of 2013, and the unemployment rate would be about 8 percent by the end of 2013, CBO projects. so hiking taxes really does retard economic growth, huh? What Is the Budget Outlook for 2014 to 2022 Under Current Law (CBO’s Baseline) (The 'Fake' Baseline that will NOT Occur)? Deficits and Debt: Budget deficits are projected to continue to shrink for several years—to 2.4 percent of GDP in 2014 and 0.4 percent by 2018 (which would be great but it won't be allowed to occur because the Bush Tax Cuts will be extended and the Medicare cuts in Obamacare and the defense cuts in sequestration will not be allowed to stand, among other spending cuts)—before rising again to 0.9 percent by 2022. With deficits small relative to the size of the economy, debt held by the public is also projected to drop relative to GDP—from about 77 percent in 2014 to about 58 percent in 2022. (Good, but won't happen) Even with that decline, however, debt would represent a larger share of GDP in 2022 than in any year between 1955 and 2009. Not good. Outlays: Outlays, by contrast, are projected to be a smaller share of GDP in 2022 under current law (22.3 percent) than they are in 2012 (22.9 percent). Discretionary spending is projected to decline relative to GDP throughout the next 10 years because of the caps on discretionary funding that stem from provisions of the Budget Control Act. Caps work. PAYGO works. Both make legislators set priorities for spending instead of just spending everything on everything and trying to make everyone happy. By CBO’s estimate, discretionary spending will fall to 5.6 percent of GDP by 2022—the lowest level in at least 50 years. Progressive liberals should be panicking as entitlement spending will continue to squeeze out education, welfare and environmental protection programs. Mandatory outlays will remain about the same as a share of GDP through 2019, CBO projects, and then will grow faster than the economy, reaching 14.4 percent of GDP in 2022, compared with 13.2 percent in 2012. more older Boomers lasting and living longer than their predecessors. What Is the Economic Outlook for 2014 to 2022 Under Current Law (CBO’s Baseline)? Which assumes that the Bush Tax Cuts expire, remember. And the cuts in Medicare and defense and discretionary spending will be made and maintained. Economic Growth from 2014 to 2017: As the economy adjusts to a lower path for budget deficits, real GDP is projected to begin growing again in late 2013. CBO must be assuming that the business community will react with relief and start investing once they feel like some adults are running the White House and Congress again. The pace of economic expansion will average 4.3 percent from 2014 through 2017, CBO projects, although the economy will continue to operate below its potential level (when output reflects a high rate of use of labor and capital) until 2018. below potential growth til 2018. Ugh. Unemployment Rate from 2014 to 2017: As economic growth picks up, the unemployment rate is projected to decline to 8.4 percent in the fourth quarter of 2014 and to 5.7 percent by the fourth quarter of 2017. Wow. Well, then, whoever wins this Presidential race is going to feel like they won the jackpot when everyone sings their praises long about 2017, won't they? What Is the Budget and Economic Outlook for 2014 to 2022 If Many Current Policies Are Continued (As in CBO’s Alternative Fiscal Scenario)? Under the alternative fiscal scenario, the most likely scenario where the Bush tax cuts are extended and the Medicare/etc cuts are never implemented deficits over the 2014–2022 period would be much higher than those projected in CBO’s baseline, averaging about 5 percent of GDP rather than 1 percent. That, ladies and gentlemen, would be around $720 BILLION MORE in additional deficits per year! Hello? Is Anyone At Home?. Revenues would remain below 19 percent of GDP throughout that period, and outlays would rise to more than 24 percent. Debt held by the public would climb to 90 percent of GDP by 2022—higher than at any time since shortly after World War II. Real GDP would be higher in the first few years of the projection period than in CBO’s baseline economic forecast, and the unemployment rate would be lower. However, the persistence of large budget deficits and rapidly escalating federal debt would hinder national saving and investment, thus reducing GDP and income relative to the levels that would occur with smaller deficits. In the later part of the projection period, the economy would grow more slowly than in CBO’s baseline, and interest rates would be higher. It has happened this way in every other nation in human history which has tried to overspend its tax revenue for prolonged periods of time and borrowed it all or manufactured it all by printing more money. Something always happens in history such as the debt-holders stop loaning money or inflation rears its ugly head. Always. America is not immune to the laws of supply and demand and economic gravity.